National Night Out, a unique crime and prevention annual event sponsored by the National Association of Town Watch (NATW), takes place each year on the first Tuesday in August. 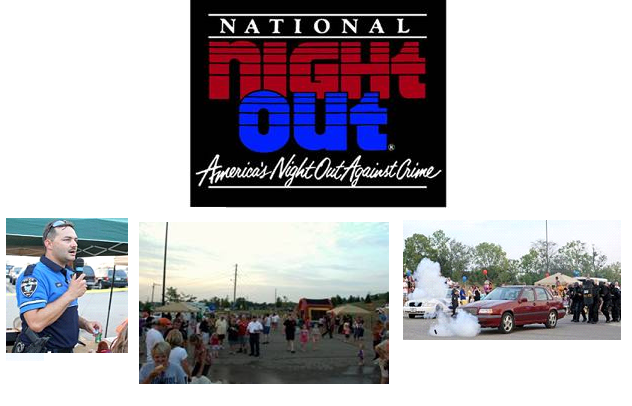 This year, National Night Out will take place on Tuesday, August 7th, 2012 6p-9p. All neighborhood organizations and neighborhood watch groups are encouraged to participate in this annual event. Previous National Night Out events have involved citizens, law enforcement agencies, civic groups, neighborhood organizations, neighborhood crime watch groups, and local officials from all over the City of Monroe. Along with traditional displays of outdoor lights and front porch vigils, City of Monroe neighborhoods have participated in a variety of events over the years that have included block parties, cook outs, visits from local police, fire department and City officials, flashlight walks, contests, and youth programs. Participating in National Night Out is an effective, inexpensive and enjoyable program that promotes neighborhood spirit and police-community partnerships in our efforts in maintaining a safe community. If your neighborhood organization or neighborhood watch group would like assistance in planning your National Night Out event, please contact Officer Eric Walton, 513-539-9234 or email him.